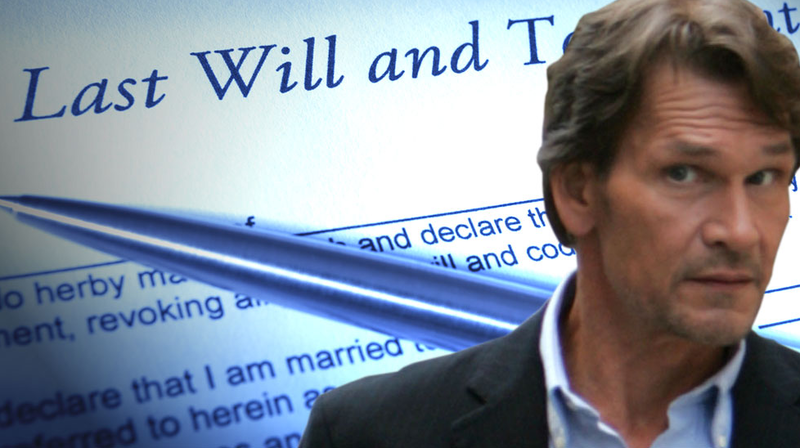 Relatives accuses Patrick Swayze's widow of forging his will. Patrick Swayze’s family isn’t letting him rest in peace amid a bombshell accusation that his will was forged! .com has learned a new claim that someone falsified his signature to inherit his fortune has caused an enormous feud to erupt. Radar has learned that a “surprise” will was filed in a New Mexico court in August that blindsided some of the Dirty Dancing star’s relatives. Swayze’s entire estate – worth an estimated $40 million – was left to his widow Lisa Niemi, 58, according to the four-page document obtained by Radar. The document in question was signed by “Patrick Swayze” and executed on July 27, 2009. The actor was hospitalized at the time, according to a family friend who believes Swayze wasn’t functional enough to sign anything! The alleged forged will left Swayze’s mother, Patsy, completely out of the picture, and also didn’t include his two brothers or his sister. Instead, Niemi’s brother, Eric, made the cut while also receiving the title of co-executor of the estate. The family is starting to suspect foul play as a result of a world-renowned handwriting expert’s claims, according to insider. Radar asked Peggy Walla, a Texas-based forensic document and handwriting examiner, to examine the will’s validity and she doubts that it was the same person’s signature! “Whoever signed it tried to appear like they were sick,” she claimed. Swayze, at the time, was dying of pancreatic cancer.